Simple CSS templates are the best place to start your website experience. Either you are a developer or a general user about to start a website for the first time, simple CSS templates are easy to use. In this list, we have collected some of the best free simple CSS templates for you. All these templates use CSS3 framework with industry code standards, so editing and customization will be easy. Another big advantage of simple CSS templates is they are easy to maintain. Even if you have messed with some of the codes, you can easily fix them in these templates. As said before, this template follows the industry code standards, so all of these templates are properly optimized. Though these are free simple CSS templates, these templates give you pixel perfect design. Functionality wise also these template gives you a handful of options, but you have to manually take care of integrating them with your other tools and platforms. Frame is a business website template built for SAAS companies specifically. But the layout of this template is flexible, so you can use it for any type of business websites. This one-page website template give you a long homepage, in which you can add all about your services. The logically arranged segments make this template the best fit for landing pages as well. Light colors are used as the color scheme for this template to match the simple design of the template. Visual effects are kept as low as possible and it is used only at the required spots. In the header, you have a big static hero image with bold texts and call to action buttons. Parallax effects will give a lively feel to this template when the user scrolls down on your page. You also get a neat pricing table with bold texts and call to action button. Shadow effects are used to highlight the best pricing plan elegantly to the users. 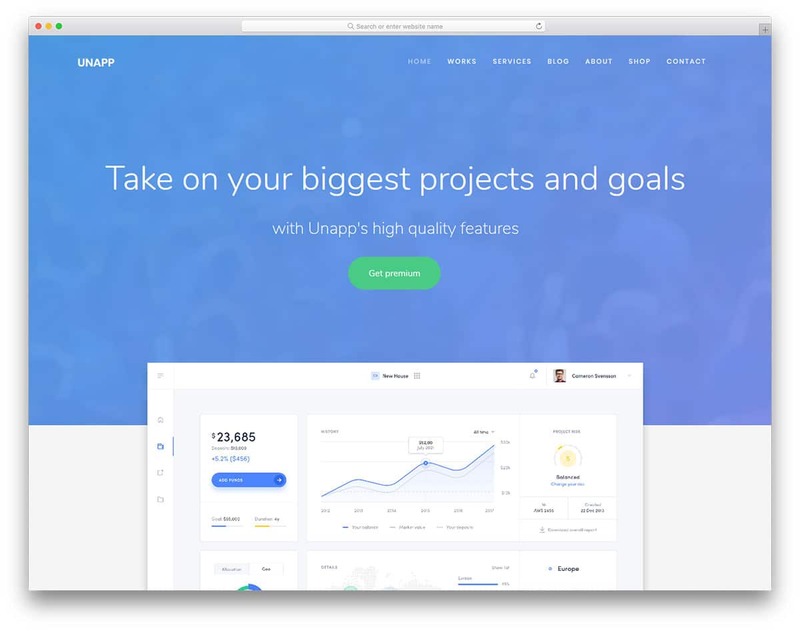 Unapp is a simple and easy to use website template. The designer of this template has given you all the important features in a simple layout. Hence even beginners can easily customize the template without losing any features. The Unapp template is designed for the app development companies and other such SAAS company website. This template possesses the character of both business website and personal website. If you are a freelance developer you can use this template to showcase your projects and your skill neatly to the visitors. In the default design, you have video background in the homepage header section, if you need you can use an image background here. Ample amount of space is given for both the images and the text contents so you can explain your products clearly to the users. Visual effects are very mild in this template and are used only at the required spot to get user attention. With this template, you get all the elements like pricing tables, testimonials, forms and many more. You can easily set up a fully functional website in no time. 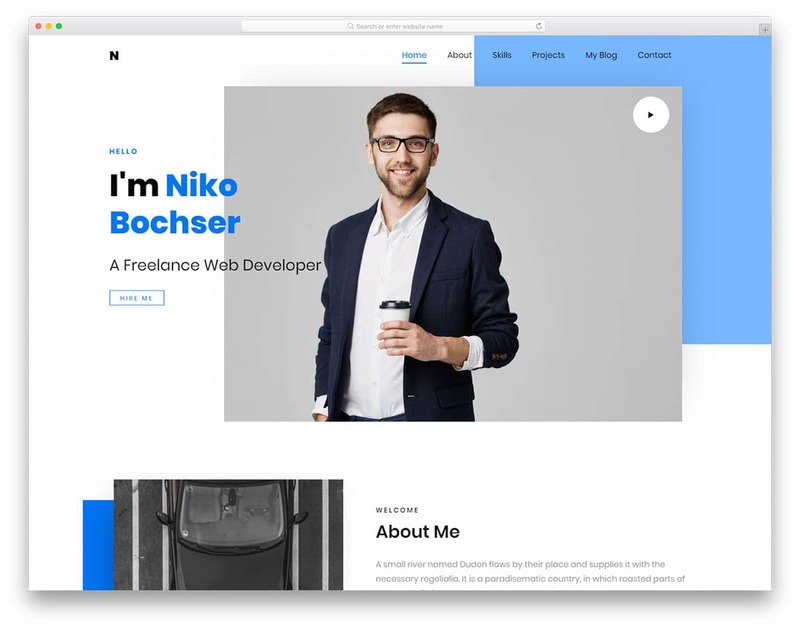 Niko is a simple one-page CSS template for personal websites and freelancers. The creator has used the CSS3 features to the fullest, hence you get a lively and light-weight website template. Though it is a one-page template the creator has given you all the elements to make a proper professional website. You can showcase your works and share your experience in this template. Since it is a one-page template, you can add only a few of your work. Customizing this template will be an easy job for the developers, hence you can add other pages if you want. 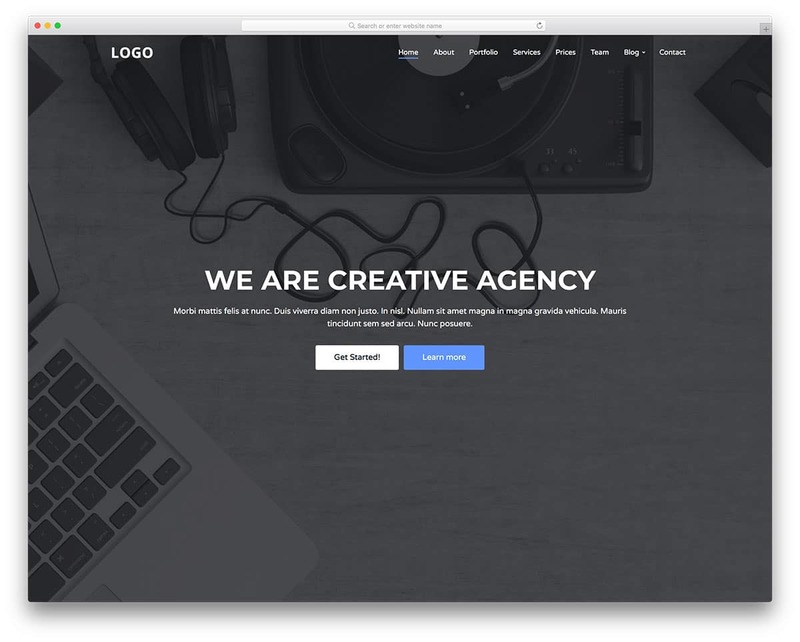 Digilab is simple and easy to use website template for agencies. With trendy design and clean animation effects this template impress the users as soon as they land on the website. Ample amount of space is given between each element for easier interaction. Since it is a mobile responsive website template, these spaces will give a better user experience on mobile devices as well. A refreshing green color scheme is used in this template which gives a rich look to the elements on the clean white background. Since it is a one-page template, smart tabs, and carousels are used to add more contents in one place. 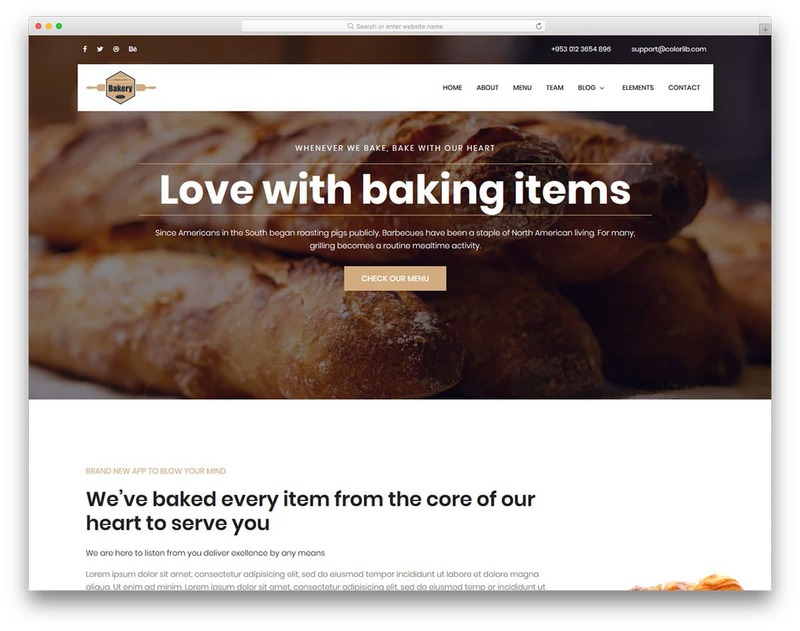 From the name itself you can clearly understand that this template is made for food business websites. 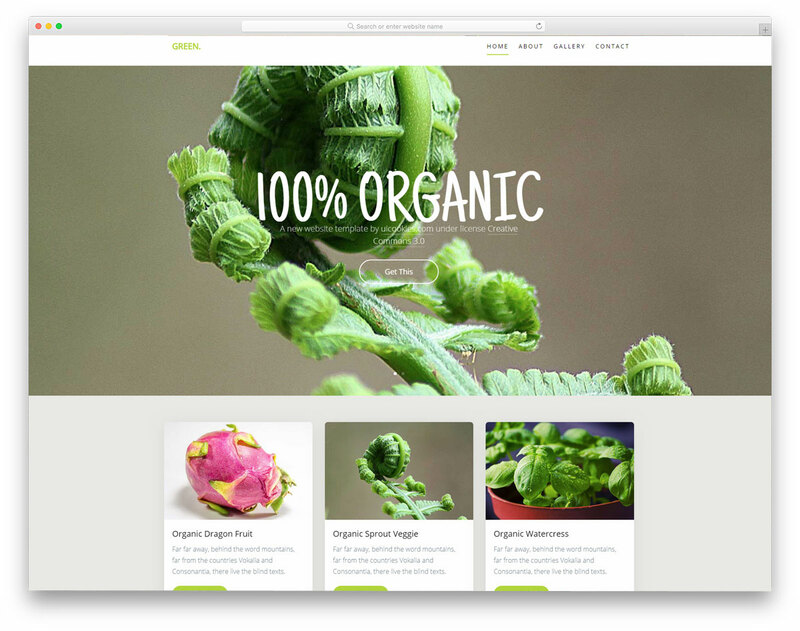 With big image holders and space for videos, this template helps you to present your foods elegantly to the users. You can easily make the user’s mouth water with this template. Basic pages including the food menu pages are pre-designed for you. All you have to do is to add your contents and launch your website. If you wish to give online table reservation option, then you have to work on the backend integration part. 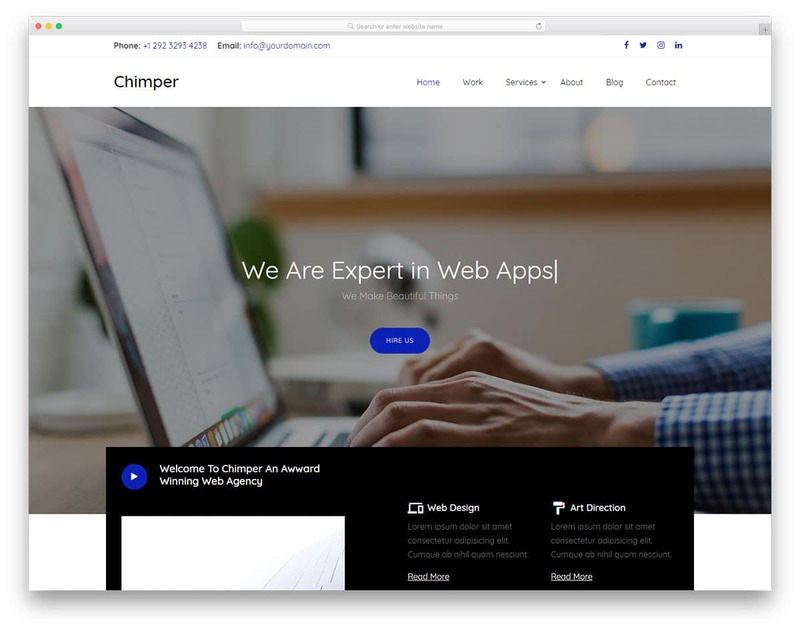 Chimper is a digital agency website template. 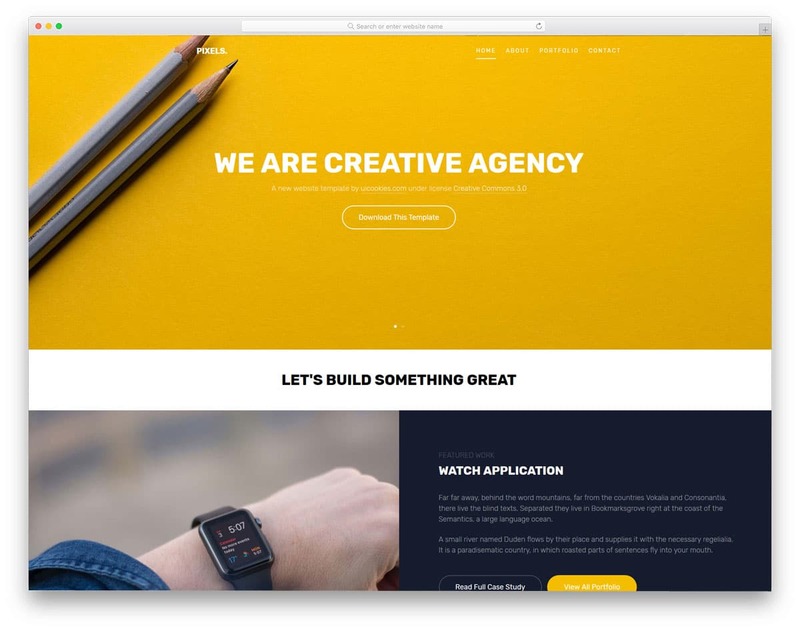 If you are making a website for startup, this template will be a good choice. The straightforward design of the template clearly explains the business as soon as the user gets into your site. In all the subpages you can see a testimonial widget near the footer section to improve your credibility. 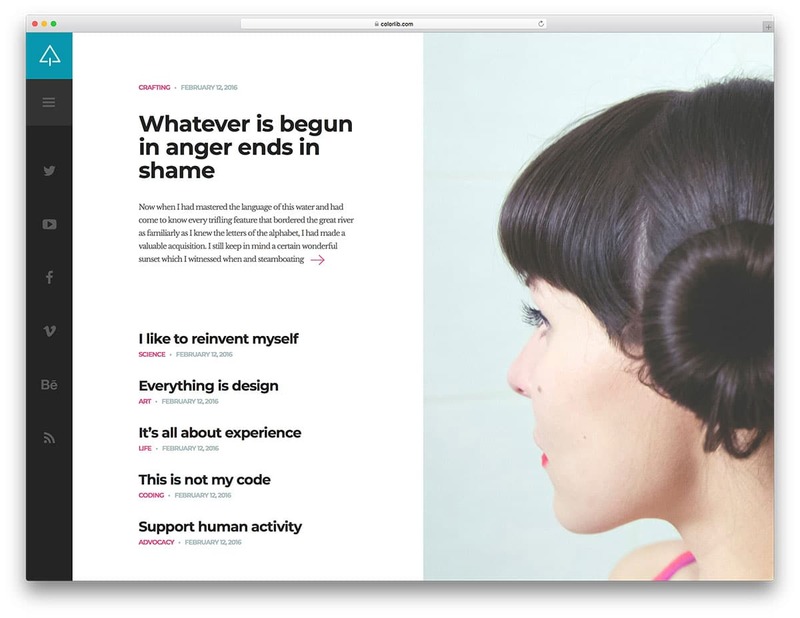 You get a separate page for portfolio, to elegantly display all your works at one place. Light and dark color schemes are used to balance the look of the template and also to elegantly highlight the important contents. Visual effects and animation effects are also kept simple to increase the loading speed of the website. 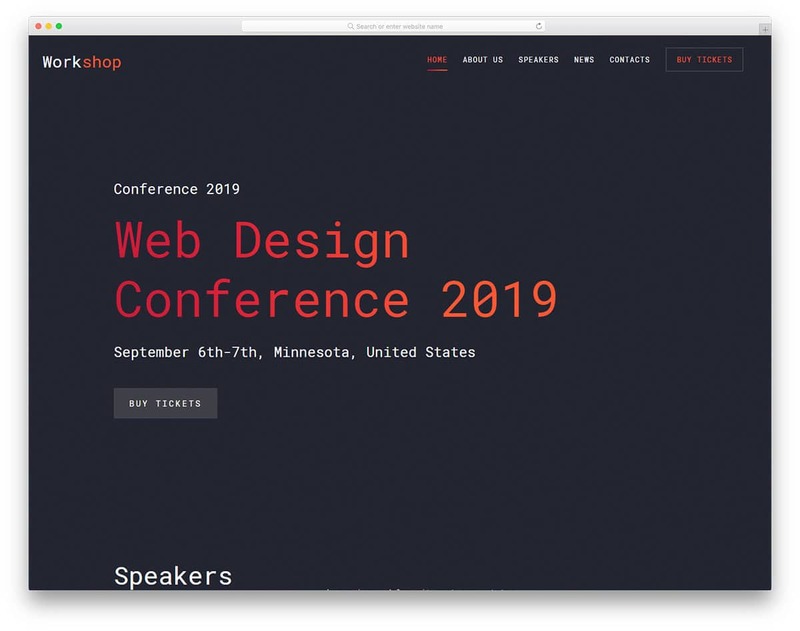 If you are looking for a dark theme simple website template, then the Workshop template will impress you. With the brutalist website look, this template is a unique looking website template in this free simple CSS templates collection. This one is originally designed for event websites, but you can use this template for other purposes as well. Another advantage with this template is it is a multi-page template. The creator has done most of the basic optimizations and saved your time in that department. All you have to do is to customize and add the features you want. 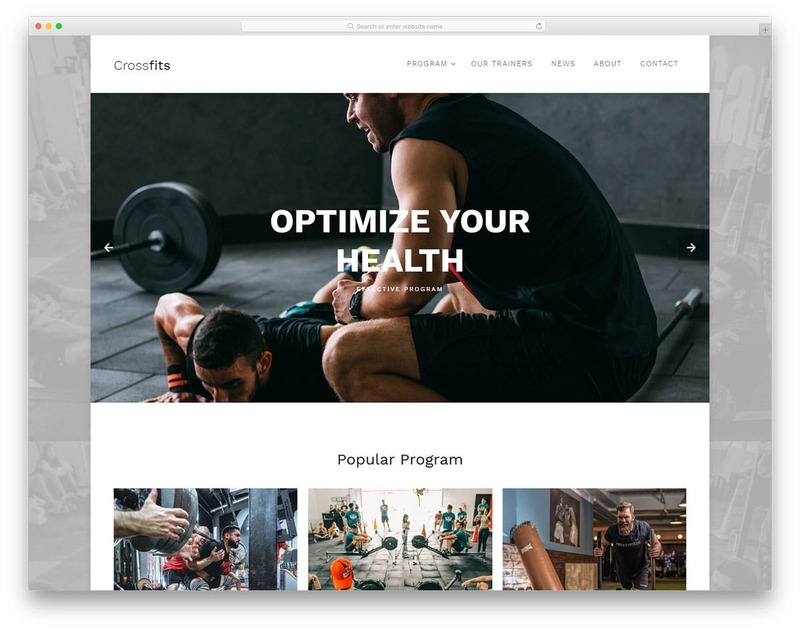 Crossfits is an easy to use boxed-width website template. This template is primarily designed for health and fitness websites. Simple layout and flexible coding base make this template a go-to option for the beginners. Not only developers even regular users can work with this template unless they need to make any serious customizations. The creator of this template has given properly named folders in the download file so that you can easily find the file and edit it easily. Visual effects and scroll effects are snappier, even the website loads faster in small screen mobile devices. As all the basic optimizations are done in this template, you can create your own custom website easily in no time using this template. Suites is a minimal website template, in which the designer has kept all the options and layout simple and clean. If their requirements are less, the users can straightaway add their contents and launch their website. Adding features and integrating new elements with this template will also be an easy job for a developer. The creator of this template has followed the code structure used by professionals so you can easily work with this template. This template is designed for hotels and travel websites. You get plenty of card elements to feature the rooms and packages, along with their images and pricing. Other useful elements in this template are pre-designed forms, icons, and countdown timers. 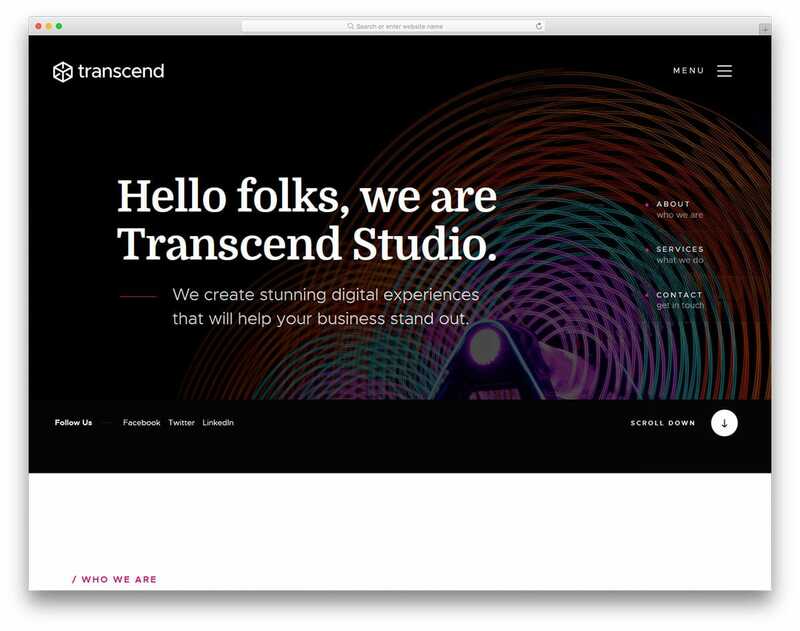 Transcend is an easy to maintain single page template with modern design. The creator of this template has used the latest visual effect features to present the contents engagingly to the users. No creative modern stuff is added in this template so the new users can easily get along with this template and customize it to their needs. Most of the space is given for the text contents than the image contents, so you have content organizing elements like bulletins and two column contents. Fonts used in this template are big and bold to make readability easier in both small screen contents and desktops. Icons with thick lines are used in this template to balance the look of the bold texts. If you have any special requirements with the icons, you can change it easily by editing a few codes in the template. 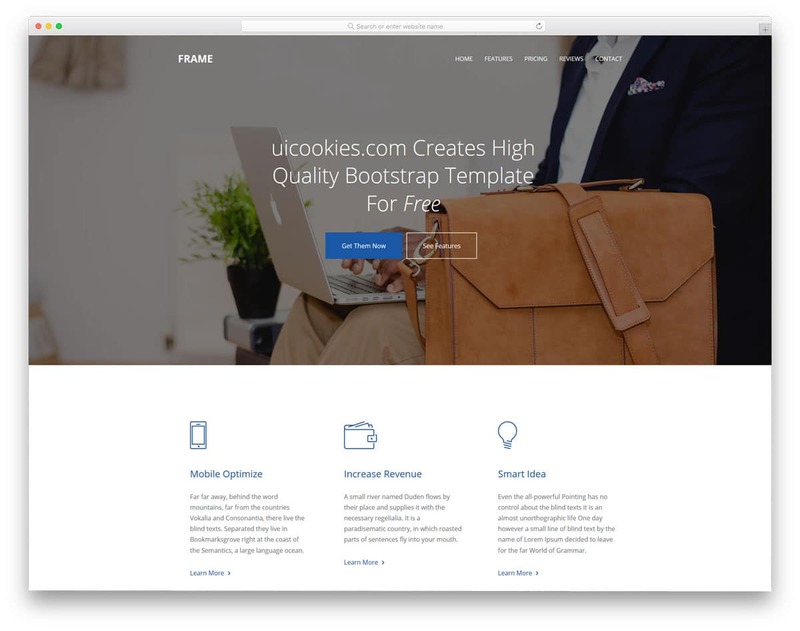 The developer of this template has used code standard followed by all professional web developers so you can use them easily. All the social media profile links are added in the header itself so you can use the footer for contact details. This template is the best option for personal websites and for small business websites. Glint is almost similar to the Transcend template mentioned above, but this template is more image-centric. 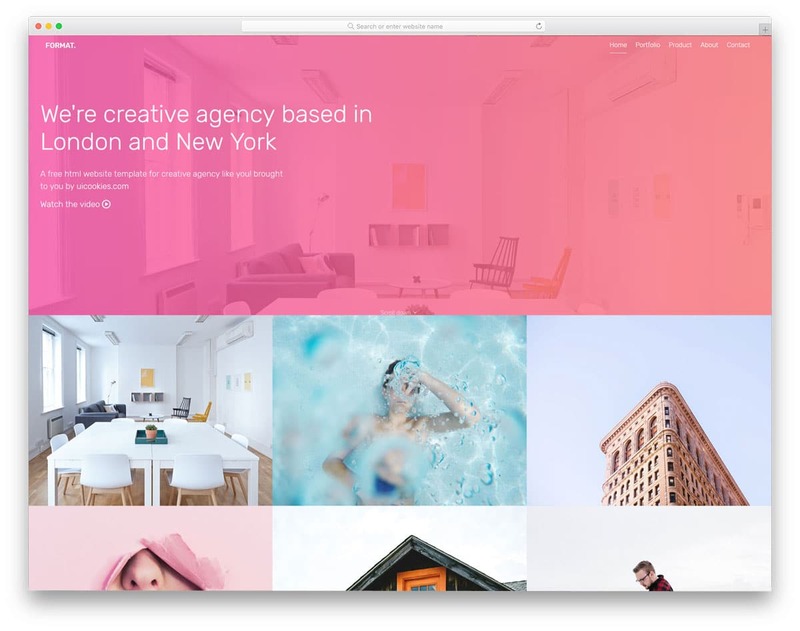 If you are making a website for photography studio or creative agencies, this template is the best choice. Each section in the homepage is treated as a slide so that you can add all the related contents in one place. Without scrolling a lot the users can easily interact with your website content. Based on your needs, you can add images, texts and other web elements in each slide. Icon set used in this template is the same one that you have seen in the Transcend template. The Glint is also a one-page template, so if you need some extra pages you have to create one by yourself. Designs and layout of this template are very simple with a clean white background, so using the same designs you can make extra pages in no time. All the navigation options are kept behind the hamburger icon, to give you more screen space for the web page contents. A neat contact form is also given in this template, if you are expecting something creative, take a look at our contact form template collection. 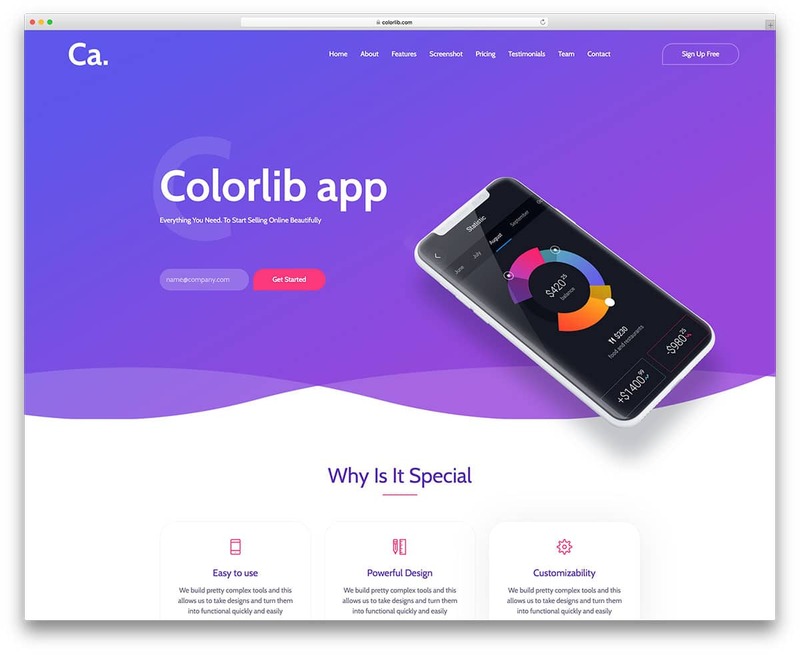 CA App landing is a hybrid template, which can be used as both landing page template and one-page website template. With the use of the latest CSS3 framework, this template shows natural colors and smooth animation effects. Since this template is designed for landing pages, you have all the sections properly organized. Users can clearly understand your products and services without spending much of their time. In the header section itself, you have an email address capturing form, to increase the chances of collecting leads. The designer has utilized the full-width layout with creative web elements and colorful icons. As video contents are dominating the digital content media, having a hero video in your landing page will increase the engagement rate and conversion rate. In the default design itself, you have space to add video contents. Other useful features in this template are pricing tables, carousels, and testimonial elements. In the top navigation bar also you have space to add a call to action button, which you can map it to the desired action. Though this template has some creative shape web elements, they are easy to customize. 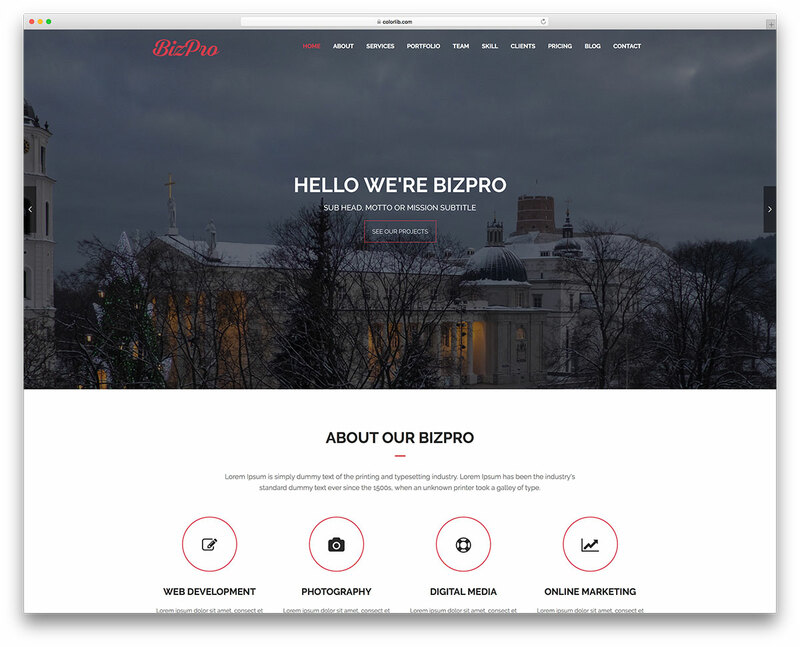 Bizpro is an interactive multipurpose business website template. With the traditional web elements and simple layout, this template is one of the easy to use free simple CSS templates. With the sharp-edged boxy web elements, this template gives you all the general features you would expect in a business website. Font awesome icons are used mostly in this template, hence you have a wide range of well-optimized icons to choose from. Hover effects are used effectively to let you show more related contents without consuming much screen space. In the header section, you have the option to use video background, simple image background, and image sliders. 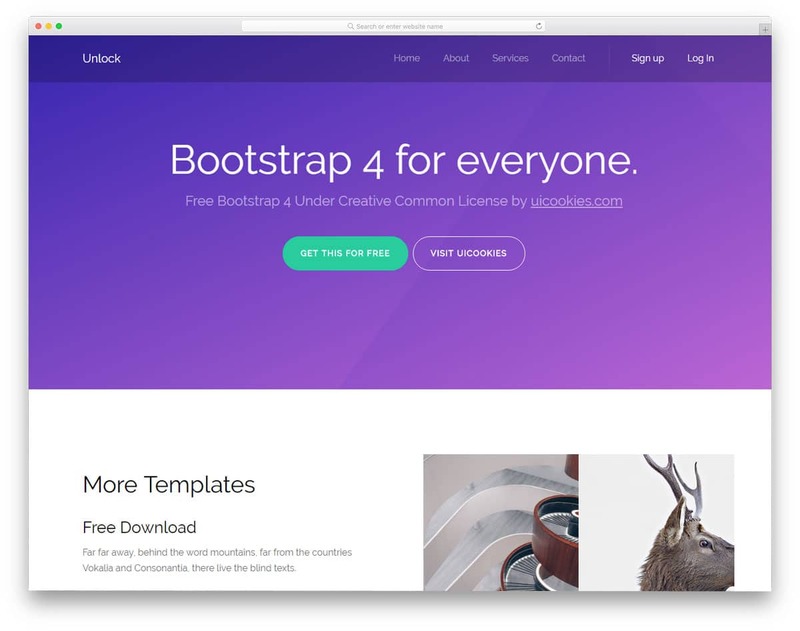 Though it is a free-template, the creator of this template has given you a pixel perfect design with a well-written code base. Any web developer will find this template extremely easy to work with. Mostly flat colors are used in this template; if you expect a more natural color, you can customize it, this template can handle it as it uses the CSS3 framework. 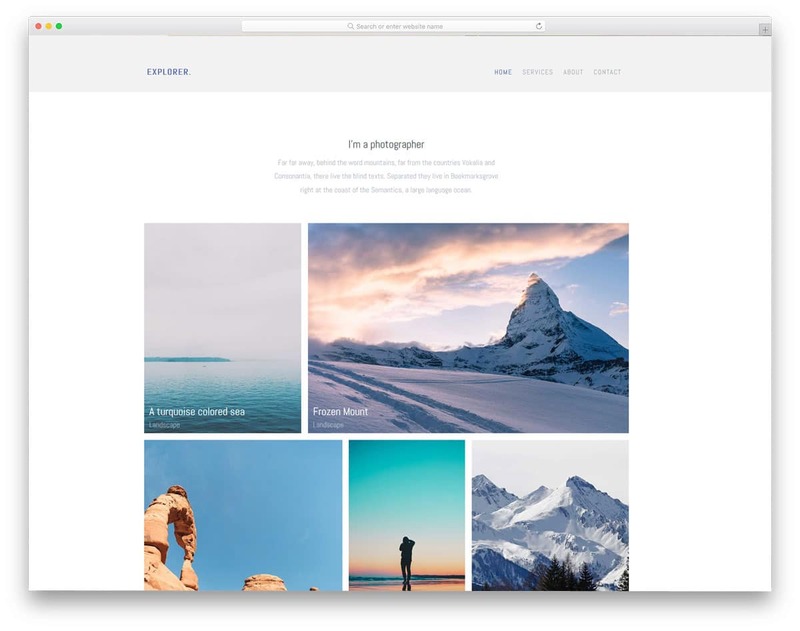 Explorer is a perfect simple website template for travel bloggers and photographers. The clean design of this template helps you to elegantly showcase your best shots. Plenty of white space is given in this template, which makes the colorful photographs look more vibrant. If you are a freelancer and use your website to get new projects, then this template could help you with that as well. This multi-page template gives you enough room to explain your services in detail to the users. Take a look at our freelancer website templates with more creative design and useful features to grow your business. On the homepage, you have only space to add a few lines about you and some of your best shots in the gallery section. You get a separate page for the gallery, so you needn’t worry about the limited gallery space in the homepage. Other useful features you get with this template are a contact form, website loader graphics, and an interactive map. Green is primarily designed for the organic food industry. The designer of this template has created this template from a business point of view. So you get lots of promotional elements and content blocks to explain your services. According to the name, this template uses green as the primary color scheme, which gives a refreshing look to the users. The icons used are also customized to match the overall simple design and color scheme of the template. Each segment in the homepage is separated by a full stretched parallax bar with an image background. Bold stylish looking fonts are used in this template to give a casual appearance. It is a multi-page website template with basic pages like about, gallery, and contact pages pre-designed for you. In all the subpage you have the option to add a big image slider in the header section. 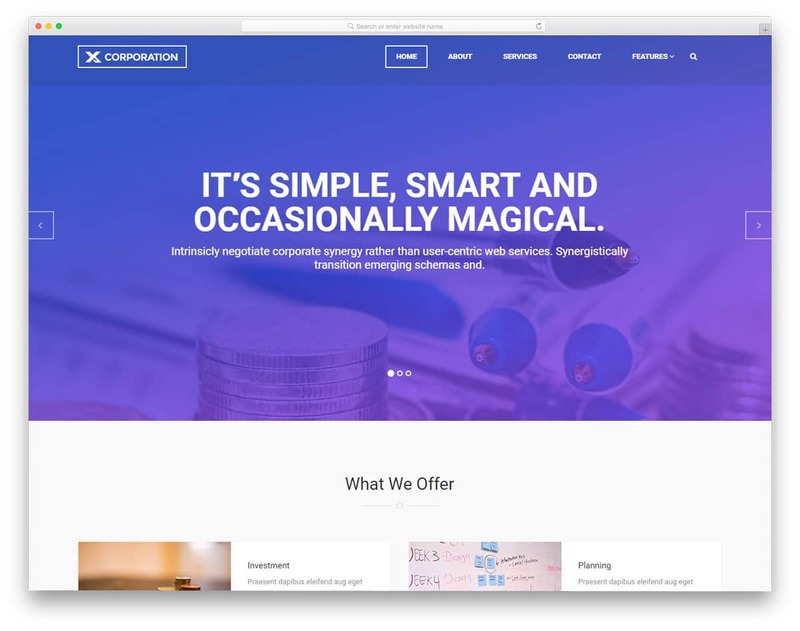 X Corporation is a feature rich business website template. Though it is a free template, the creator of this template gave us plenty of useful features. This template gives equal importance to both text contents and image contents so that you can create an engaging website. Gradient color schemes are handled effectively throughout the template to elegantly highlight the important sections and points. Font selection is also done with care in this template since it is a business template, formal looking fonts are used. Animation, on the other hand, is very subtle and is used only in the required section. Navigation menu options are given in both the top bar and in the footer for better user experience. Throughout the template font awesome icons are used. Even if you need to customize this template, you have plenty of icon options to choose from the font awesome icons. 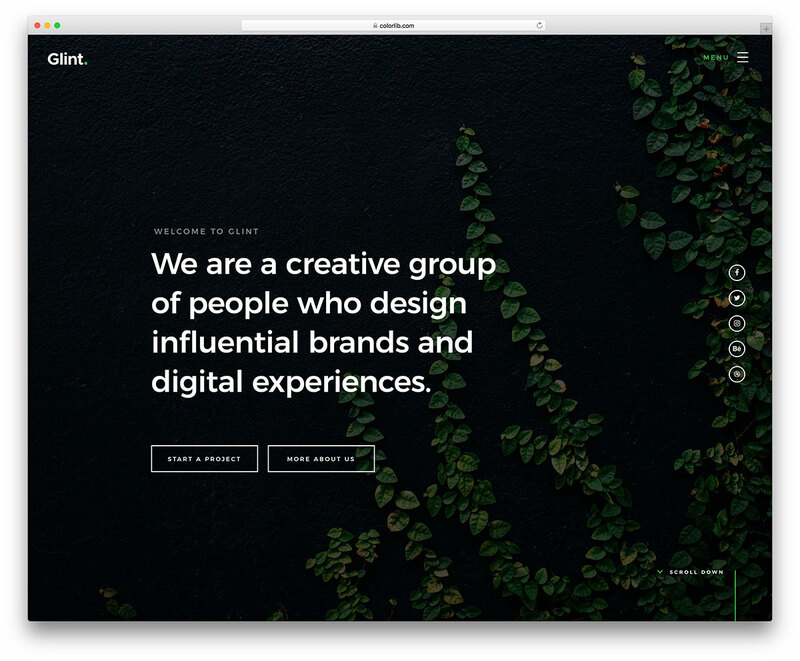 Pixel is a bold website template with big sections and large texts. The bold website templates are always easy to interact in both the small screen devices and desktop screens. Big elements make sure that the accidental clicks are reduced and also gives you enough space to add all your contents. This template is designed for multipurpose use, so you get plenty of elements which you might find useful now and some of the elements will come in handy in the future. The content blocks are designed to handle both the texts and the images effectively. Visual effects are combined smartly with the neat design to keep the user engaged with your content. Both bright and dark colors are used in this template and the designer has maintained the balance of colors smartly throughout the template. Just above the footer section testimonial sections are used in all the subpages to improve your credibility. 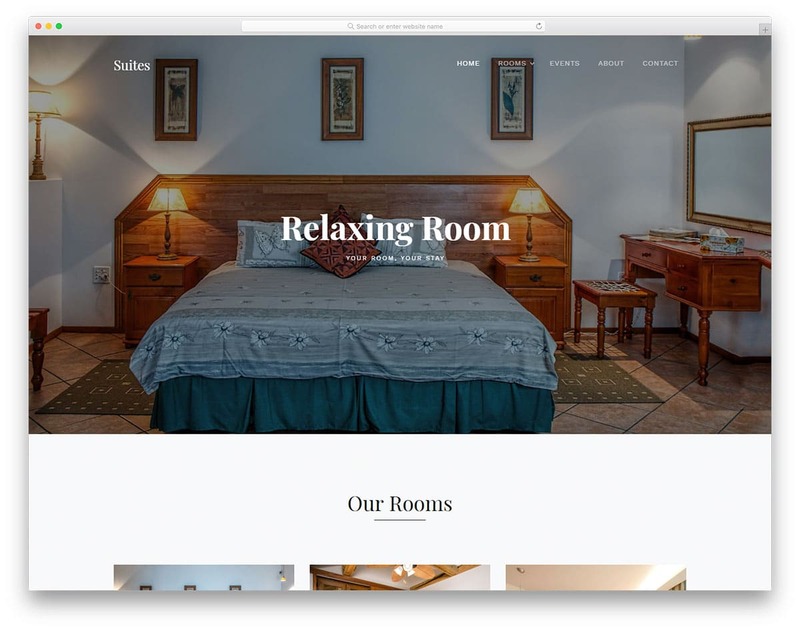 Format is simple website template for hotels, travel websites and photography websites. The creator of this template has made the layout flexible enough to make it meet the needs of all the niches it is been designed for. All types of contents are used in this template and most importantly they are placed in the apt spot for a better result. The pink color scheme of this template gives a soothing feel to this template and make it an obvious option for girls website. Line icons are used in this template and are customized to match the overall design of the template. Spaces for video contents are not given directly in this template, instead, space for links is provided. Since it is an HTML5 template, you can add videos easily. The video player opens in a separate lightbox window to give users a complete control over the player. 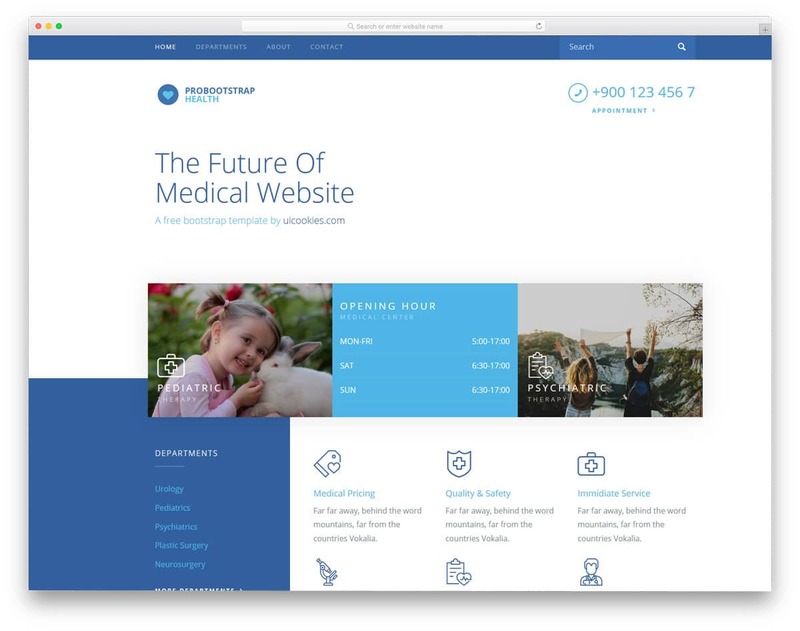 Health is a feature packed medical website template. 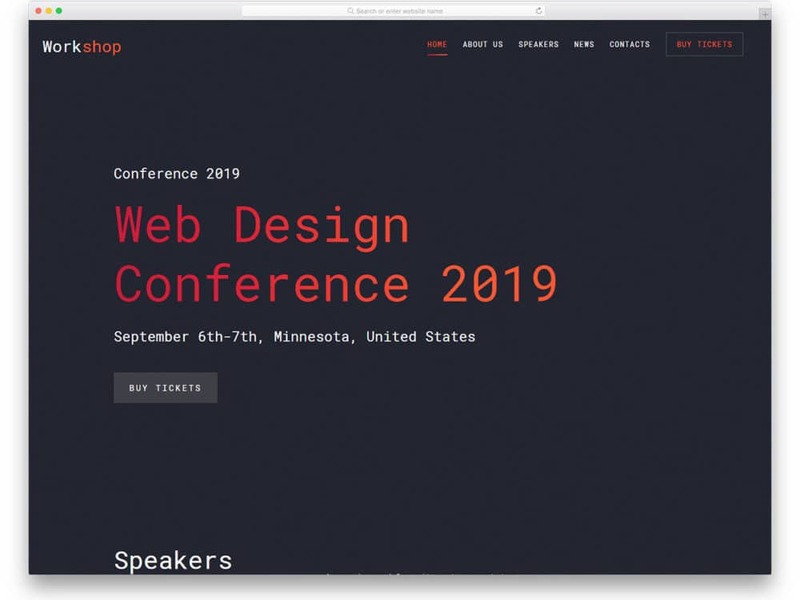 The creator of this template has used the HTML and CSS framework elegantly to bring all the contents in the given space. This template does not use regular sections with a boxy design. In order to highlight important points, some of the content blocks are made to stick out from the regular boxes. For beginners, this template will help you to get the idea of developing a creating design. Different shades and tints of blue color are used in this template. The designer has used the colors elegantly throughout the template. Other useful features you get with this template are appointment booking form, neat custom icons, and animated counters. The appointment form is in a perfect working condition from the front-end, all you have to do is take care of the backend process. 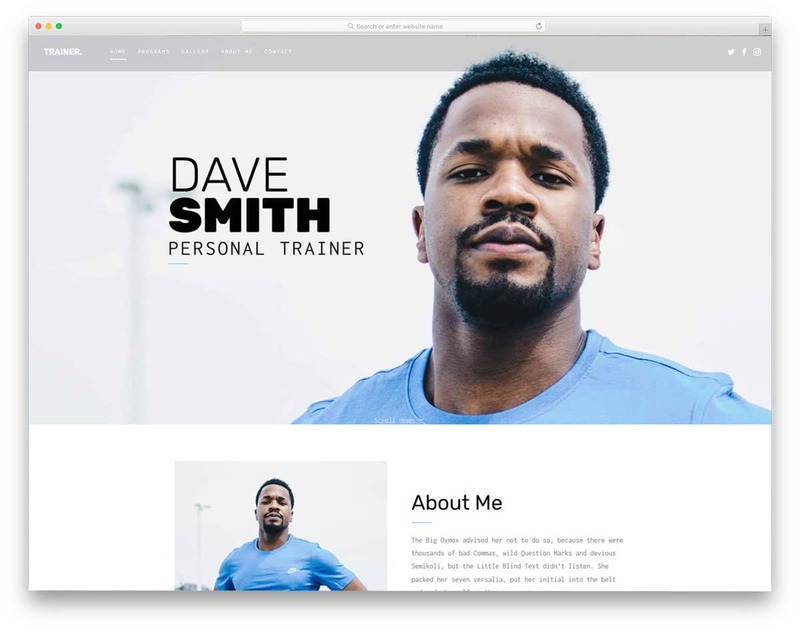 Trainer is a personal website template. In the demo version personal trainer theme is taken to showcase the template. With the clean pristine design, this template gives you plenty of space to add both image contents and text contents. Images are used instead of using icons to show the services elegantly to the users. Fonts, on the other hand, they are not regular formal looking fonts. Though the fonts look casual the readability of the texts is not compromised. 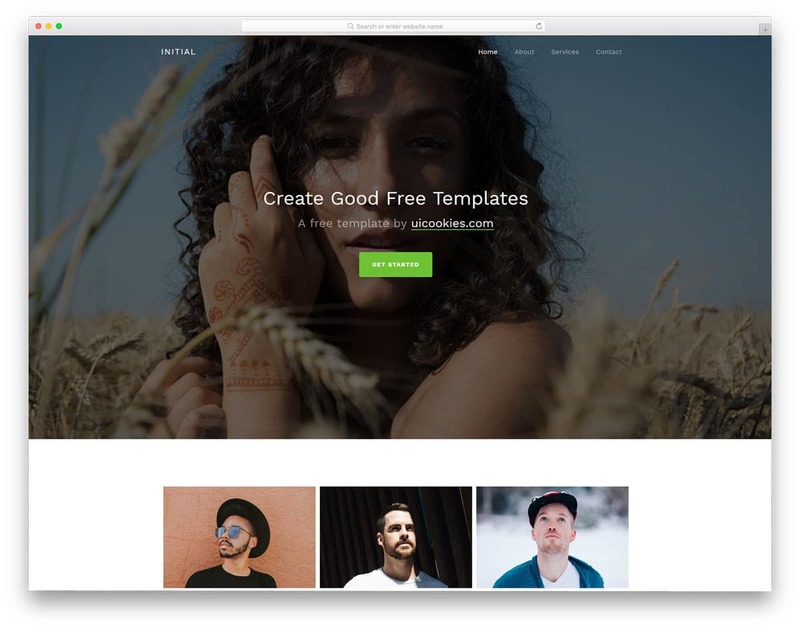 Since it is a personal website template, lots of image space to add your photographs is give in this template to improve your personal branding. At the top bar, you have the option to add social media profile link. The footer section is made big enough to add all important links and other contents. 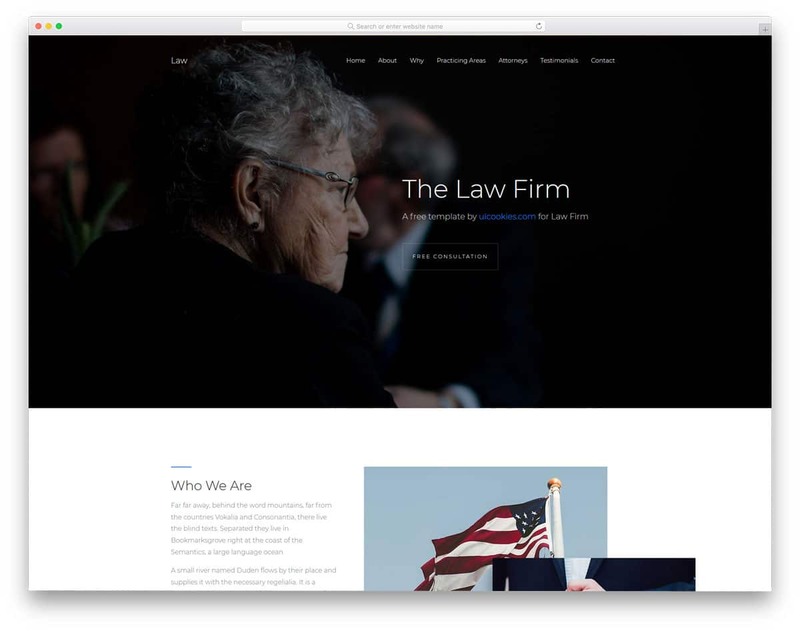 Law is another simple website template for personal websites. This template is designed specifically designed for the white collar professionals. Being a white collar professional you might get only a few hours to spend on your website. Since it is a one-page template the user can manage the website easily in the few hours they get. Though this is a one-page template, the creator of this template has given us all the options we need to create an effective website. On the clean white background, the images and the texts are clearly visible. All the elements in this template are scaled to perform better even on small screen devices. Other useful features you get with this template are accordions, custom line icons, neat image sliders, and subtle professional looking animation effects. 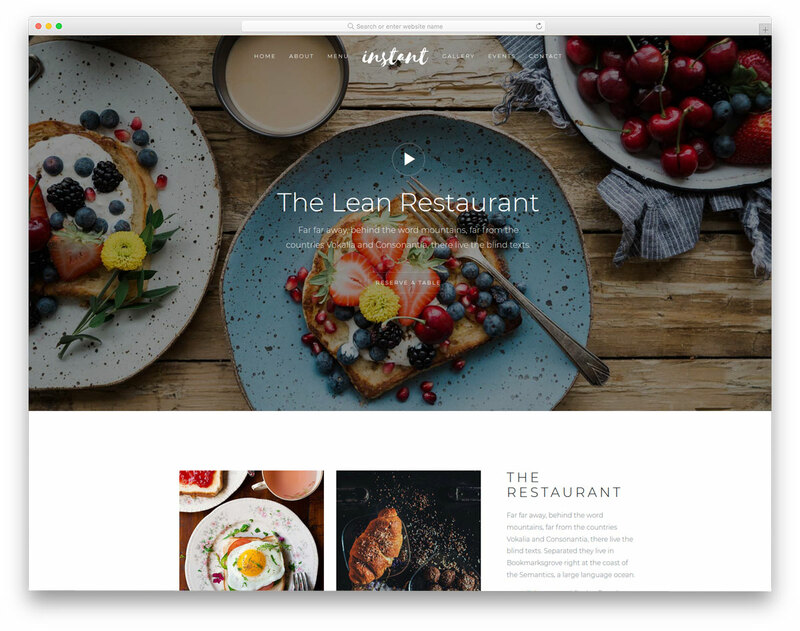 Instant is a simple restaurant website template. This one-page template is made very simple and easy to use. All you have to do is replace the existing content with your own unique custom contents. Only the necessary features are given in this template to set up a proper restaurant website. Like all other food-related website templates, this one also gives more importance to the image contents. You can share your mouth watering delicious food images elegantly with this template. The clean white background of this template makes the colorful food images look more vibrant. Food menu option is also given in this template, in which you can share your best food along with their price. If you are about to use online food ordering service on your website, you can integrate this well-coded website with your tools easily. Landing as the name implies this template is properly designed for the landing pages. Expert says laser-focused content helps you to make a successful campaign. 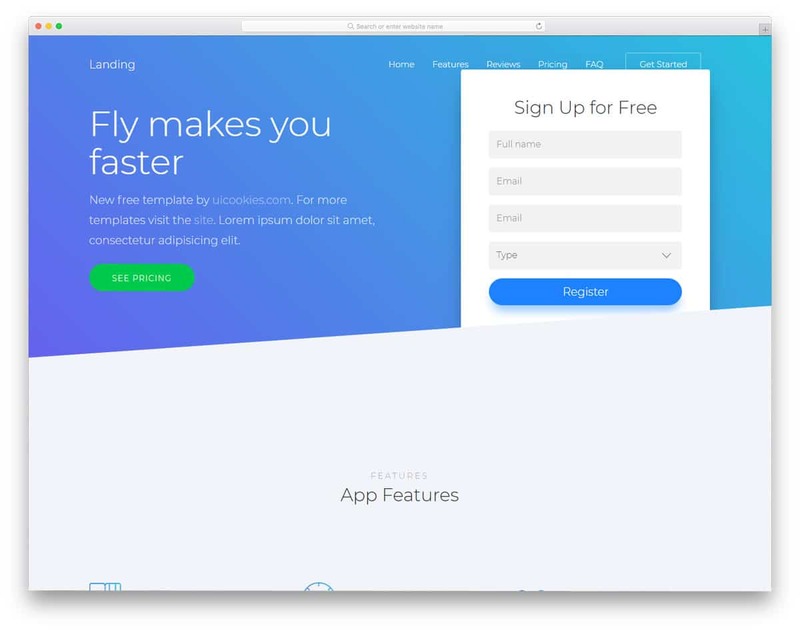 This template will help you create a laser-focused landing page easily. Each section in the homepage is made big enough to hold large contents and web elements. Since conversion is the main focus of the landing pages, you get the conversion-focused elements placed at the right spots. For example, in the header, you have a registration form to let the user know they can register here as soon as they land on your page. The top navigation bar is kept sticky to let the user jump to any section easily then and there when they want. Aside is a perfect blog template. If you are about to start a new blog, then this template will give you a good base. Especially if you are a travel or food blogger this template is the best option for you. 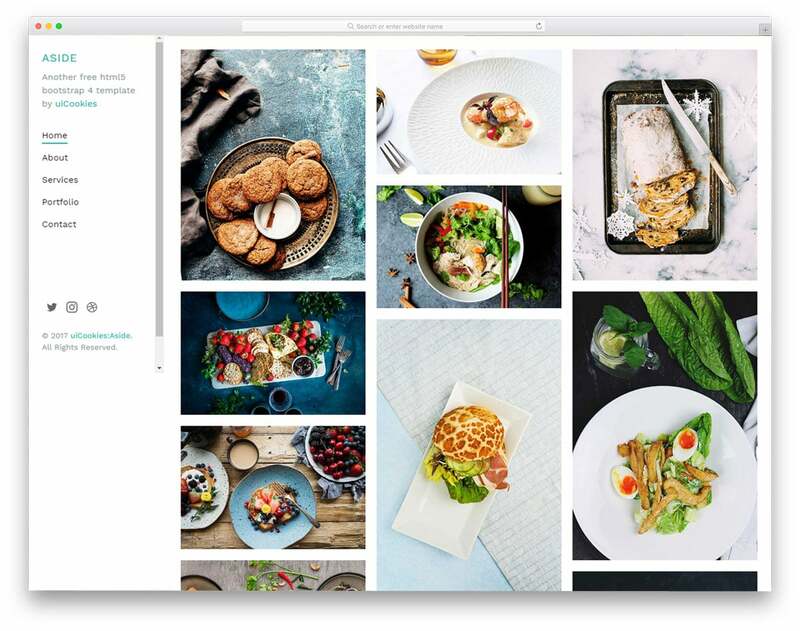 The Pinterest style homepage gives you only space to add images. You have the option to add image links in the homepage to take the user directly to the corresponding posts. Image holders of all sizes are given on the homepage, so you can add images of any size and orientation without any worries. The sidebar navigation gives you space to add your logo and social media profile links at the footer. Other subpages you get with this template are about, services, portfolio, and contact. Unlock is a very simple basic multipurpose website template. The designer of this template has created this template in a very open-minded approach so that you can use it for any purposes. All the elements and the options given in this template are multidisciplinary to make it the best suit for all purposes. Each segment is made big enough to add images and other types of long contents. Text contents are also given equal importance in this template so that you can explain your services in detail to the users. Vector icons are used in this template and they are customized to fit in well with the overall design of the template. Both gradients and solid colors are used in this template. The designer has used the color combination perfectly to highlight the important points and also to improve the visual aesthetics of the template. 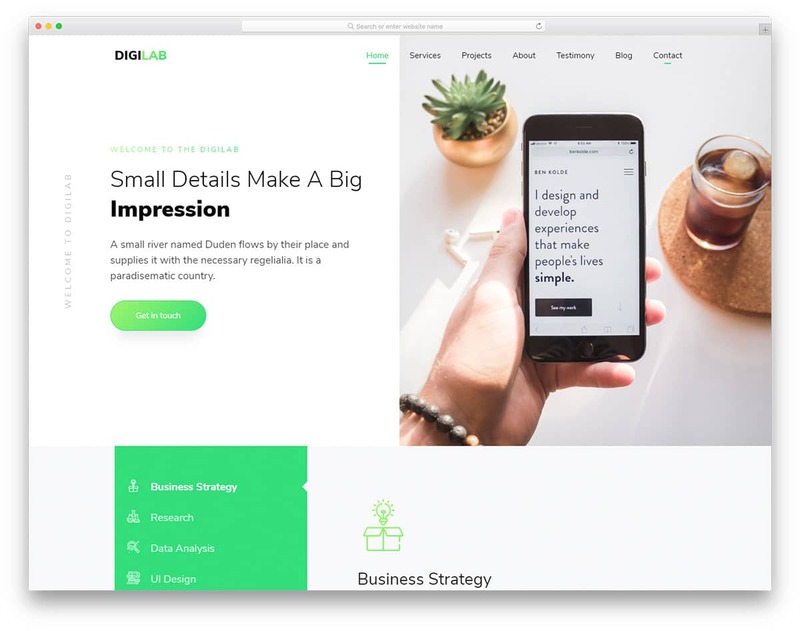 Initial is also a multipurpose website template, which can be used for both business websites and personal websites as well. With lots of white space, this template helps you to present the contents neatly to the users. No matter how long or wordy the content is the given white space will make the content look cleaner. Flat icons are used in this template, which fits in well with the overall simple design of the template. The flat green color scheme looks attractive on the clean white background. Other useful elements you get with this template are carousels, preloader graphics, and neat custom icons. 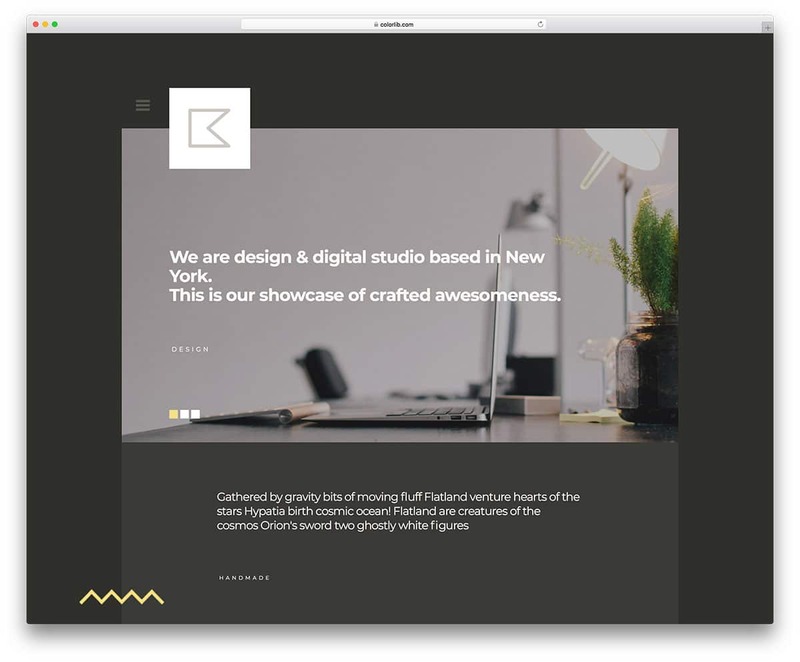 Katt is a simple creative website template. Shapes and patterns are becoming one of the most used modern web design styles. This template uses creative design along with the attractive visual effects to create an engaging website template. The boxed content layout helps you to organize the content effectively. The default design of this template makes it a perfect option for a blog template. Even if you are looking for a creative blog design inspiration for your existing website template, you can use this one. In the header, you have a small image slider with smooth transition effects. The main content block area is designed like a split screen, where you can add images and texts side by side to create engaging contents. 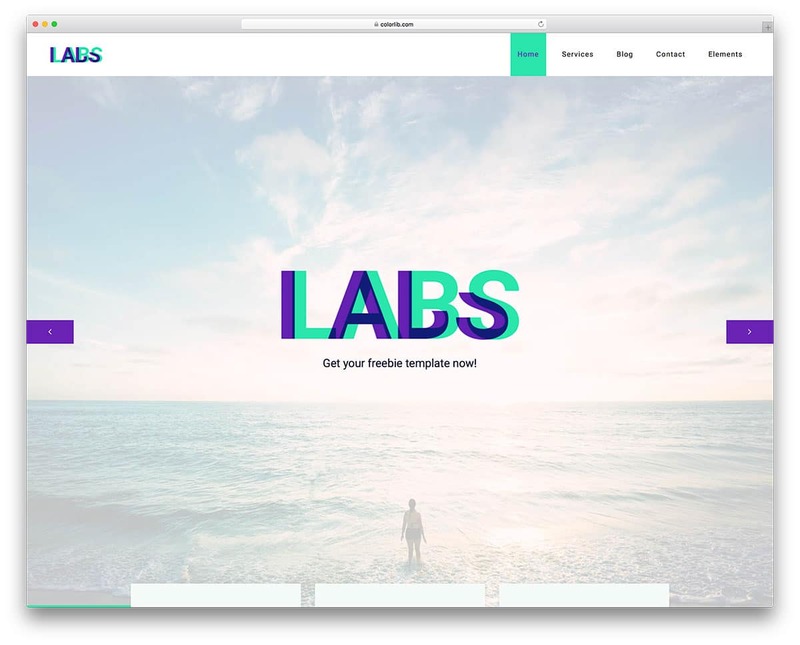 Labs is a creative colorful website template. With the help of latest HTML5, CSS3, and Bootstrap framework this template gives you more lively colors and modern web elements. To fill up the empty background space the designer has used geometrical shape patterns. As said before creative geometrical shape patterns are one of the trending modern web design. Another highlight of this template is the color combination. The peppy purple color and refreshing green color gets user attention easily and also gives your visitors a refreshing feel. It is a multipurpose website template, so you get plenty of multidisciplinary elements fits in well for all types of basic website needs. Suppablog is a personal brand focused website template for freelancers and influencers. The core design of this template revolves around the owner of the website. This template includes plenty of web elements to boost your personal brand and also improve your visibility throughout the website. Not only the design but the visual effects are also made simple in this template. The blurry hover effects help you to clearly highlight the important text that the user wants to see. Whole navigation options are hidden behind the hamburger menu on the left side. In the left sidebar, you also have the option to add social media profile links. Creative agency, as the name implies this simple template is designed for the agencies and other business websites. With the long homepage, the creator of this template gave us more space to add to your business. On the clean white background, the inky black texts are clearly visible. Texts are made bold and bigger so that the user can read the contents without any trouble. You can even use this template as a homepage inspiration for your custom website development. This template uses HTML5, CSS3, and Bootstrap framework with industry grade code standard so that you can customize and add it to your existing website work easily. 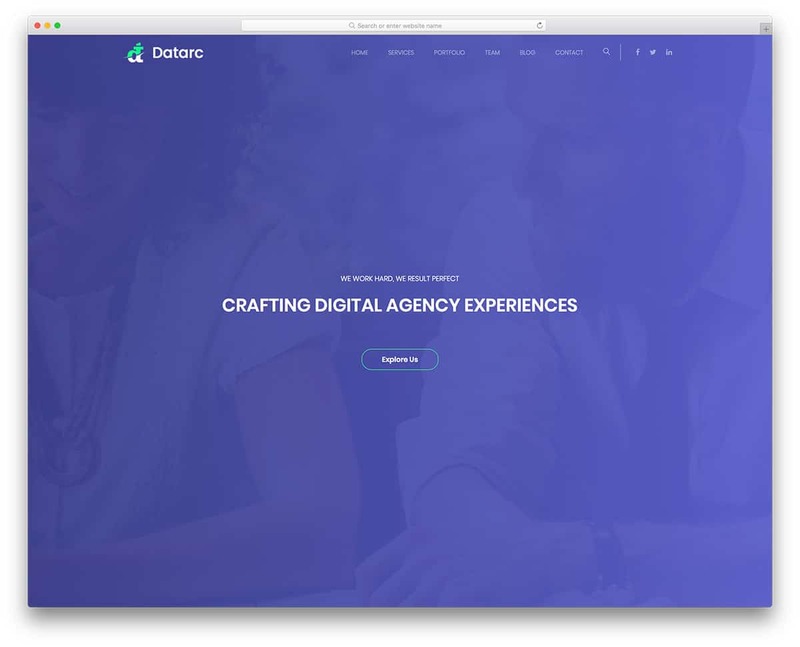 Datarc is another modern looking website template for startups and creative studio. Since it is a one-page template, the designer of this template has made each section big enough to hold all your contents. Ample amount of space is given between each element and the full-width design of the template is used effectively. With this single page template, you get sections like services, portfolio, team, and contact. The portfolio section is a two-row grid with a tabbed interface to let the user easily switch between categories. Animation effects on this template are neat and professional so that you can use this template even for business websites without any worries. 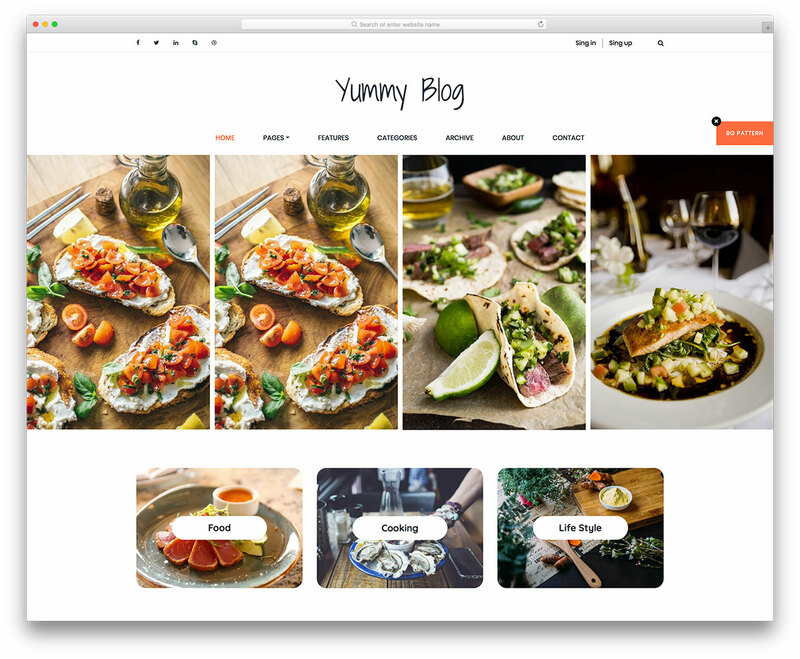 Yummy is simple and clean looking food blog template. You can use this template for any types of personal blogs like fashion, lifestyle or be it be any kind, this template can handle it. If you prefer you can even use image pattern in this template. The designer of this template made sure that the elements and the text contents are neatly visible in both the background version. This template has lots of space to add images. In the header, you have a big portrait style image slider. Visual effects are great in this template and will surely get user attention easily. Just above the footer, you have fully stretched widget for adding Instagram feeds.